"I have come not to disturb or destroy any faith, but to confirm each in his own faith, so that the Christian becomes a better Christian, the Muslim, a better Muslim, and the Hindu, a better Hindu." 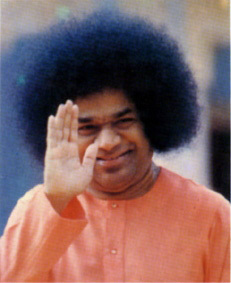 Sathya Sai Baba is also considered by millions around the world to be an incarnation of God. He says is one part of the 3 avatars of Sai, a Sai Trinity, that are to lead mankind to another Golden Age and a time when mankind will bow down to India as the spiritual hub of the world. His first incarnation was as Shirdi Sai Baba in Shirdi (1835 - 1918), his current being Sathya Sai Baba, born in Puttapurthi in 1926 and his final incarnation to come 8 years after he passes away. This third incarnation will be known as Prema Sai Baba. Baba states that all 3 incarnations are one with the same mission of turning people to God, each in their own time span, method and environment. See below for more information on each incarnation and why Baba incarnated. Click on an image below for information on each incarnation of Sai. A long time before Sai Baba came about, a Rishi (Sage) Bhardwaj spent a lifetime in the quest of knowledge and complete and thorough mastery over the sacred Vedas, he was very spiritual and had a connection with God. But even after a life span of one hundred years, devoted and consecrated to that thirst for Vedic knowledge, he realised that he was merely standing at the shore of the ocean only gathering pebbles and the pearls still lay hidden in the depth of the ocean. Feeling sad and disconsolate and faint on account of withering old age, he approached Indra, the king of demi-gods in heaven, and prayed to him for lengthening his life further. The boon of another hundred years was granted to him and he resumed his quest with additional vigour. Time passed and the fresh lease of hundred years of life came to an end. But Sage Bhardwaj felt that the ocean of knowledge lay still before him and he was thirsty and insatiated as ever. The knowledge was limitless and infinite and life too short. Although he was granted 3 centuries of existence, at the end of the period, he stayed on the fringe of Vedic knowledge. He approached Indra again and renewed his plaint. This time Indra praised him for his great unquenchable thirst for knowledge and his consistency and advised him to organize a yagna and invite the primeval divine mother Parvati to preside over the yagna. Parvati is also known as Shakti, the wife and consort of Lord Shiva, who in turn is recognised as one of the three main forms of the supreme Brahma (creator), Vishnu (maintainer) and Shiva (destroyer). Indra assured him that this would crown his effort and enable him to garner the true and full knowledge of the sacred lore. Sage Bhardwaj actually did organise a full-fledged yagna (Vedic ritual) and travelled to the snow-capped Mount Kailash (Everest) of the Himalayas, a holy place to call upon Lord Shiva and divine mother, Shakti. At the time the divine couple were engaged in a competitive cosmic dance, trying to find out who could dance the longest, totally engrossed in each other. Sage Bhardwaj waited for 8 days in intense and freezing cold of the region. Mother Shakti appeared before him and indicated through her gesture that she would attend his yagna, but unfortunately, Bhardwaj failed to understand her positive sign. Utterly exhausted and disconsolate, the sage turned around to go back. No sooner than he took a few steps on the frozen terrain he fell down on the icy ground and his left limbs were paralysed. 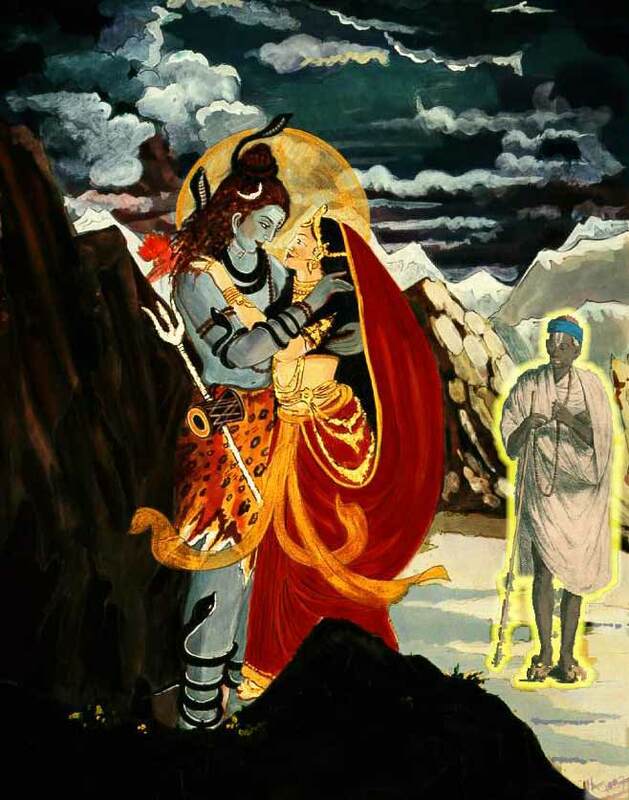 Lord Shiva and Parvati both heard him fall. Shiv Shankar, the compassionate Lord, moved towards the Sage and raised him. He sprinkled few drops of water on the body of the Sage from his Kamandulu (water pot) and spoke to him in soft and sweet words said "Bhardwaj, Parvati and I will grace your yagna with our presence and your desire to gain Vedic knowledge will be crowned with success". He then conferred another boon by saying that he would incarnate in Kali Yuga (the present dark age) thrice in order to bless his gotra and lineage for this suffering. Lord Shiva went on to say "In my second manifestation in the Kali Yuga I would live in a body along with Shakti then this Shakti would remain immobile and motionless and would suffer a similar inertia, pain and paralysis as you have suffered here under the frozen cold". Thus, the boon vouchsafed to sage Bhardwaj has come to fructify in the Kaliyuga. First, Lord Shiva manifested himself as Sai Baba of Shirdi in the state of Maharashtra, India and later at Puttaparthi in Andhra Pradesh, India as Sathya Sai Baba, the composite androgynous God, ardhanarishwara, the masculine and feminine aspect of Shiva and Shakti rolled into one. Sri Sathya Sai Baba has prophesied that the third Sai incarnation would take place at Mandya district in Karnataka, India after he attains maha samadhi at the age of 96 years. The point to note here is that all this is not mere fancy or fairy tale. If we cast a glance at the advent of Sai Baba of Shirdi, the circumstances of his birth, his arrival at the Shirdi village and making it his playground for his leela and his splendour and majesty, the truth of the matter is revealed. When before Gurupurnima day in 1963, Sathya Sai baba had suffered a stroke and a series of four major heart attacks and the doctors diagnosed tubercular meningitis, Baba refused to take medicines and injections, saying that he would be all right in a few days time time. But actually on that very evening of Gurupurnima, Baba descended the circular stairs down to the prayer hall. 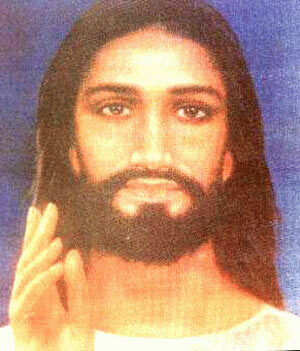 He sat on the chair before five thousand, silent and sorrowful people. Then he gestured for water, drank some and sprinkled some drops on his paralysed left hand and stroked the stiff left leg and hand. Then the miracle of all miracles happened. Swami become immediately normal, cured of all his firmity, stood up before the audience and delivered his addressing clear and resonant voice and continued for an hour. The devotees danced with joy. As prophesied by Lord Shiva in Treta yuga to sage Bhardwaja, Sathya Sai Baba who was born as Shiva-Shakti in one enacted the miracle of healing his paralysed left limb (Shakti) by his right hand (Shiva). 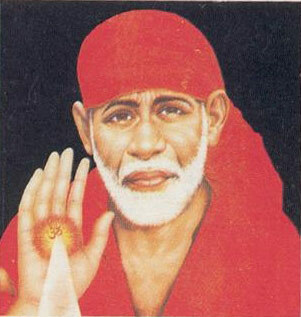 The previous Avatar, Shirdi Baba, laid the base for secular integration and gave mankind the message of duty as work. The mission of the present Avatar is to make everybody realise that the same God or divinity resides in everyone. People should respect, love and help each other irrespective of colour or creed. Thus, all work can become a way of worship. Finally, Prema Sai, the third Avatar, will promote the evangel news that not only does God reside in everybody, but everybody is God. That will be the final wisdom that will enable every man and woman to go to reach God. The three Avatars carry the triple message of work, worship and wisdom.